A few mornings ago it was five degrees here in Apollo with a minus eight wind chill and swirls of falling, icy snow pellets. The next afternoon it was 61 degrees with bright blue skies and abundant sunshine. An amazing swing in just 36 hours! Last week in New Mexico we ran through a similar temperature fluctuations over just a couple of hours as we hiked through the winter-cold in a snow storm at the top of the Sandia Mountains, and then strolled in the spring-mild in the greening vegetation alongside the Rio Grande, and then walked in the summer-warm bright sunshine and 70 degrees on the sidewalks of Albuquerque (we dressed in layers that day!). It does challenge your body and mind to flip through such drastically changing environments so rapidly. We are hoping that we stay in Spring-mode here for a while (but I already have seen the snowflakes ahead on the five day forecast!). We missed the migrating flocks of sandhill cranes while we were in New Mexico (photo above by Frankyboy5, Wikimedia). They had been in the fields and wetlands along Albuquerque’s section of the Rio Grande for the past several weeks but had moved on toward their northern breeding ranges just a few days before we arrived. 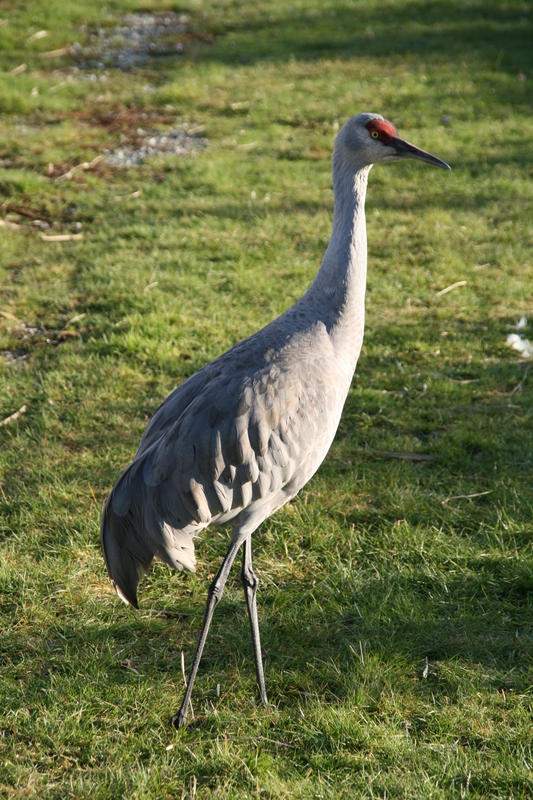 I last saw sandhill cranes when I was at Texas Tech taking ornithology forty years ago. They were the highlight of a very cold, mid-February, early Saturday morning field trip to the wetlands outside of Lubbock. We did get to see the state bird of New Mexico while we were in Albuquerque, though. 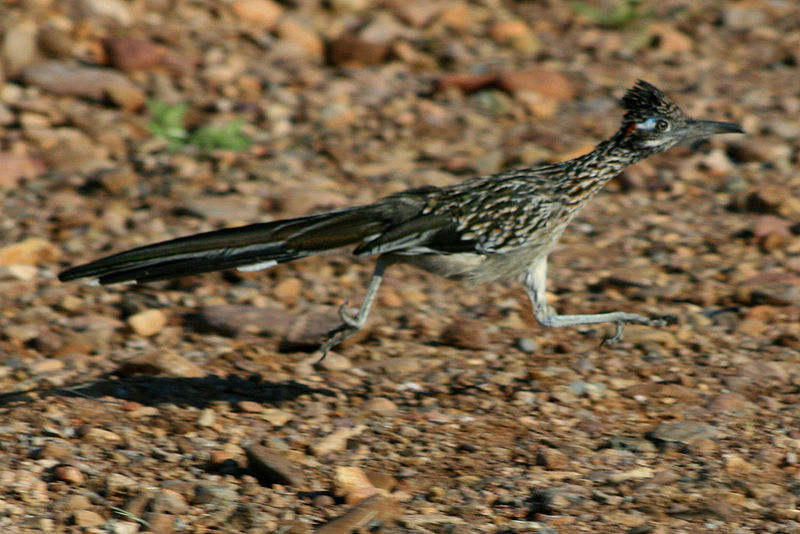 The greater roadrunner is a large (two feet from beak to tail), lean, bird with long legs and a distinctive head crest of feathers. They run rapidly after their prey (insects, spiders, small rodents, lizards, and snakes)and can reach speeds of up to 26 miles per hour (substantially slower, by the way, than the top speed of a coyote!). They also eat seeds and fruit and can be found not only in the dry shrub lands around Albuquerque but also in its residential areas. One in particular has made regular appearances around our daughter’s house near the University of New Mexico. He didn’t show up while we were visiting, though, so the only greater roadrunner we saw was at the Albuquerque Zoo (photo by El Brujo+, Wikimedia). But, there is bird news here! The robins have arrived in Apollo in force this week. There is a large flock variously occupying the still-bare tree branches and the leaf-covered grass of my lawn and field. The leaves on the ground are quite a draw for the robins, in fact. They spend a great deal of time flipping through the leaf layers with their beaks and feet looking, I assume, for insects or worms. Their focus and continued activity makes me think that they are finding something there to eat. This is another piece of supporting evidence for leaving the autumn leaves where they fall, or at least piling them up in corners of the yard rather than burning or discarding them. The leaf piles are a great overwintering site for insects and other invertebrates and a much appreciated smorgasbord site for the early spring birds! Common grackles have also arrived in southern Armstrong County (photo by D. Sillman). Most bird distribution maps indicate that the common grackle is a year-round resident of Pennsylvania, but the grackles that visit my feeders through the spring and summer definitely spend their winters somewhere else. A small, noisy flock of grackles descended upon my sunflower seed feeders and bird baths a couple of days ago and have been back each day for a not so leisurely meal and drink. Many of the grackles glean seeds from the ground but a few more acrobatic individuals balance their long bodies up on the tiny feeder perches and contort themselves to get some seeds. The resultant tipping and shaking of the feeders spill abundant seed for the ground feeding birds and may represent some type of intentional (but probably accidental) altruistic synergy for the group. The smaller birds (the cardinals, the chickadees, the titmice, and house finches) keep their distance from the decidedly dinosaur-looking grackles. The caution shown by these birds is quite justified as grackles do have a reputation of not only raiding the nests of many song birds but also killing and eating smaller, adult birds. Many people feel that the common grackle is a pest. They do considerable damage to crops (especially corn) and are so aggressive that they even chase blue jays away from feeders. I am more tolerant of grackles than most, however. Back in the early 1990’s when we were having outbreaks of gypsy moths here in Western Pennsylvania, I watched grackles pick gypsy moth caterpillars off of my spruce trees and take them out into our street where they beat them on the rough asphalt to remove their irritating body hairs. They then gobbled up the denuded caterpillars. The grackles would stay busy all evening doing gypsy moth eradication. You have to admire the genius (is the street surface a tool?) and the vigor of this species! Another, but not altogether welcome sign of the approaching spring is the emergence of the hordes of brown marmorated stink bugs that have been overwintering in the hidden spaces and tiny crevices throughout our house. Each even slightly warm day stirs a dozen or so stink bugs out of their winter torpor. Deborah and I have been scooping them up and tossing them out the nearest window. We’re hoping that most of them will freeze during the frigid nights. Their abundance and persistence are daunting, though. I will keep looking for the elusive signs of spring! Next warm evening the earthworms will undoubtedly rise up, but that’s a topic for next week.